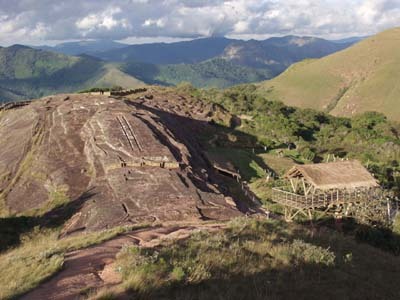 El Fuerte de Samaipata is an archaeological site in the eastern foothills of Bolivian Andes, which also is a popular tourist attraction, both for Bolivians and foreigners. It has architecture from three different cultures - Chanes, Incas and Spaniards, which makes it unique. The oldest remains were built by the Chanes people. These were destroyed by Guarani warriors. Later the Incas expanded into the area. And during the colonial period Spaniards had a settlement there, which was later abandoned. There are several ancient carvings on the rock, some estimated to be connected to the passing of Halley's Comet in March 1066. There are also two parallel lines known as El Casabel, pointing directly to the point where Venus and Jupiter had a parallel rise at sunrise to the background of the constellation Leo August 20, 1066. To protect and preserve the carvings, some of the inner areas are off limit to the public.